Gunner Francis Hazzledine enlisted in the Royal Field Artillery at the Derby Road Recruitment Centre in Nottingham on 13th September 1915. He was born in Beeston in 1898, the only son and second child of Francis & Ann Hazzledine and lived with his parents at "Leopold Cottages", 59, Humber Road2. He attended the Nether Street School and was a keen member of the local Lads Club, where he secured three medals and an anchor during the many happy years he spent there. 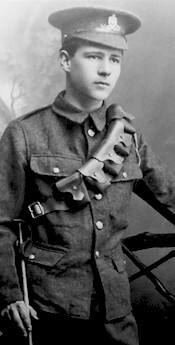 Previously employed as a Surgical Mechanic, until September 1914, he was stationed locally at Wollaton, when he first joined the colours. It was during his training that he was unfortunately taken ill and hospitalised for a short time. After recovery he was sent to France in June 1916, but returned back to England a year later where he again spent time in hospital suffering from shell shock, and it was here that he received news that his uncle, Private George Hazzledine, had been killed in France. After returning again to the front line, he was part of a team of Gunners positioned in a Gun Pit, on Tuesday 15th October 1917 during the "Battle of Third Ypres" which was struck by an enemy shell. He died instantly; his body was brought down to the wagon line, and later buried in a cemetery some five miles from the front. 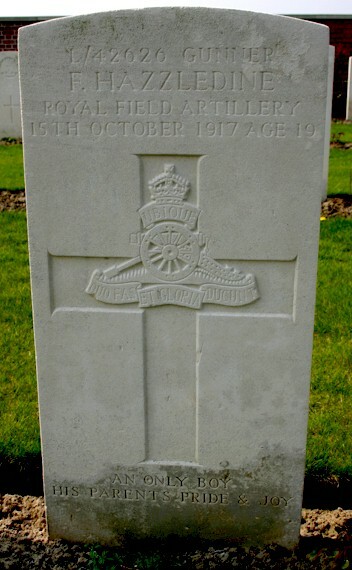 Buried either side of the 19 years old gunner, in Huts Cemetery, in Belgium were two officers of his battery who had been killed the day before. The cemetery gets its name from a line of huts that housed some field ambulances. These were kept busy from a line of gun positions, of the Royal Field Artillery. 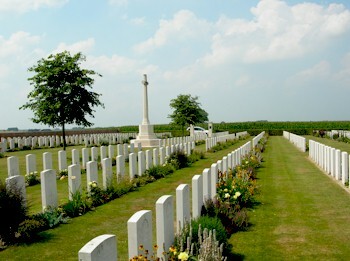 Over 70% of all burials in The Huts Cemetery came from Artillerymen, killed by the Germans shelling their positions. 2This was the address of his parents as recorded in the Commonwealth War Graves Commission records. In 1901, the family were living at 7 Salisbury Street, Beeston, Notts. 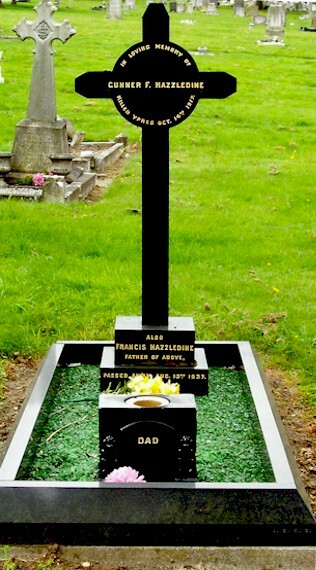 Francis, his father (born about 1874 in Beeston), worked as a railway labourer. His mother was born in about 1876 at Cheltenham as Ann Blackwell. They married at Beeston Parish Church in 1895. His sister, Annie Elizabeth was born in 1896 and married Thomas William Cockerill in 1919. Both father and son used the name "Frank".